MSV will be back with more but here's some initial broad analysis on the council forum last night. First thanks to Melissa Abernathy of QLC for her effort launching a live broadcast. MSV was able to set that up in time and tonight we're going to try to help and make it better for the mayoral forum at 7:00. Some initial thoughts on the 10 member panel and audience. Great turnout and a strong reform minded group on hand. Nice to see considering the circus the City Council meetings have been in recent months. Care for an encore Reform? The well behaved crowd overall had two notable moments. First, the topic of vote-by-mail fraud came up - remarkable in and of itself. The dirty secret in plain sight has become a dirty secret no more. When Frank Raia's turn came late in the question, many in the audience burst out in spontaneous laughter and a certain Beth Mason paid political operative looked none too happy about any of this being discussed. Perhaps he would prefer a wrestling question. The only audience interference came on a City budget related question and again it was Frank Raia the lightning rod as he clearly has not forgotten being bounced off the Board of Ed by the voters. He went on a tirade complaining about BoE spending and was heckled from the audience on the same side of the room. 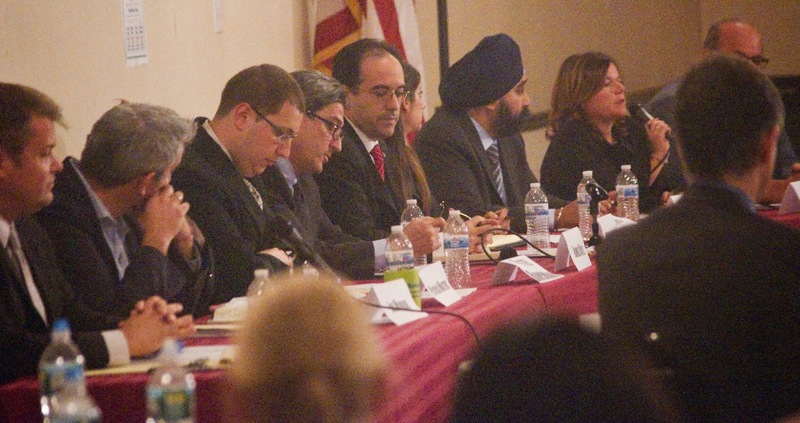 This is a Hoboken City Council forum no? Back to the vote-by-mail question. Council members Dave Mello and Ravi Bhalla did not shy away from the "problem" while most of the other candidates agreed to voice Switzerland answers supporting legal vvm participation. One exception was Joe Mindak who vocalized discontent wondering why the practice of vote buying continued to exist. (Welcome to Hoboken corruption Joe and would you care to join the fight?) Patricia Waiters urged residents "not to sell your vote" all but admitting to the ongoing blatant fraud. The only person who attempted to make a defense of the massive voter fraud in recent elections was BoE commissioner Peter Biancamano who is on the Raia-Mason ticket. He gave a long answer decrying "voter suppression." Where have we heard this defense before? Most recently it was Councilman Michael Russo using those same words when a mano a mano ensued with Councilman Ravi Bhalla over the issue early this year. Russo called it Republican voter suppression and Bhalla called it exploitation. Back in 2010, the Tim Occhipinti campaign used the same language of voter suppression when voter fraud was brought up before its campaign irregularities found their way to the NJ Attorney General's Office. Currently, MSV is aware of over one-thousand vote-by-mail ballots outstanding for the entire city. Of those, about 400 were coming out of a corner of the fourth ward. The Hudson County Board of Elections added a new measurement: ballots mailed versus ballots by messenger. Does Da Horsey need to tell you how the Hoboken Housing Authority and affordable housing locale ballots are finding their way to the county? The vast bulk are not arriving by mail but by messenger. Is everybody too busy to mail a ballot in due to a hard campaigning schedule? Last, although on the whole candidates were well spoken and gave strong positions and answers; this election comes down to not who do you believe can complain best but who can work towards solutions and most importantly - WHO CAN YOU TRUST? MSV recommends you watch but more importantly listen to the forum. If you can't spare time, at least go to the final part and hear the closing remarks by the candidates in part four. Council candidate row at the Elks last night. Tonight at 7:00 it's the mayoral candidates' turn. Talking Ed Note: Moderator Bob Bowdon did very well using weighted questions from the audience as a focus of the debate. Rent control came out front and center and later so did Vision 20/20. MSV will be putting up a complete video clip on the controversial redevelopment project. Questions are taken from the audience so if you have one, show up tonight and hand it in. A question on the budget surplus came up framed quite oddly as a Beth Mason talking point although she was not there. How did that happen? The question was would you give the surplus back to the taxpayers? Every single candidate answered they wanted a surplus of some amount for a rainy day and dedicate some of it to various areas of concern but not a one mouthed the Beth Mason canard. For those new to MSV and there's a stream of new visitors, in her brief tenure as Council President, Mason attempted with Michael Russo, Terry Castellano, Nino Giacchi and Timmy Occhipinti to strip any surplus from the City for any emergency. Any as in ZERO! More to come but for now, please see the videotape.